National University of Science and Technology NUST is considered to be one of the best engineering universities of Pakistan. NUST NET-I entry test is expected to be conducted in Dec 2018. NUST also offers business programs but most of the students apply for engineering departments. Their main focus is to provide quality education and to create opportunities for their students after graduation. Every year thousands of students apply for NUST but due to limitation of available seats few are able to secure admission. 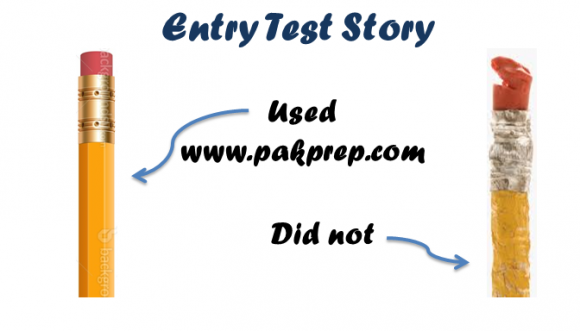 NUST test is considered to be one of the toughest engineering test in Pakistan. Minimum 60% marks are required in SSC and HSSC. Candidates after clearing FA/FSc part one can apply for test but their admission will be confirmed after part two result. All non FSc candidates must have equivalence certificate issued by IBCC, with minimum 60% marks and relevant subjects. Candidates of O/A Level can apply on the basis of equivalence certificate obtained from IBCC. Merit for BS Applied Biosciences program will be based on complete FSc / A Level or equivalent qualification (as per IBCC Equivalence Certificate) result. FSc Pre-Medical with additional Math’s ​O level (SSC) equivalence of “Science group” and A level (HSSC) equivalence of “Pre-Engineering group” including Math’s, Physics and Chemistry as mandatory subjects. ​BS Computer Science ​FSc Pre-Engineering / Computer Science Group ​O level (SSC) equivalence of “Science group” and A level (HSSC) equivalence of “Pre-Engineering group” OR “Computer Science group” including Math’s, Physics, Chemistry/Computer Science/Computer Studies as mandatory subjects. BS Applied Biosciences ​FSc Pre-Medical Group ​O level (SSC) equivalence of “Science group” and A level (HSSC) equivalence of “Pre-Medical group” or any other group with three subjects including Biology and Chemistry as mandatory subjects. ​BS Accounting & Finance ​HSSC with Math’s or Accounting and Finance or Accountancy as one of the major subject. ​O level (SSC) equivalence and A level (HSSC) equivalence with Math’s or Accounting and Finance or Accountancy as one of the mandatory subject. ​BS Mathematics ​HSSC with Math’s ​O level (SSC) equivalence and A level (HSSC) equivalence with Math’s as one of the mandatory subject. ​BS Physics ​FSc Pre-Engineering Group or Computer Science Group ​O level (SSC) equivalence and A Level (HSSC) equivalence with three subjects including Math’s and Physics as mandatory subjects. ​Architecture and Industrial Design ​FSc Pre-Engineering Group or Computer Science Group ​O level (SSC) equivalence with Math’s & Physics as mandatory subjects and A level (HSSC) equivalence of “Pre-Engineering group” or any other group with three subjects including Math’s and Physics as mandatory subjects. Selected candidates will be required to provide Medical Certificate issued by any government hospital or a registered medical practitioner at the time of joining a programs of study. Medical Certificate Form will be emailed / sent to the selected candidates along with the Provisional Selection Letter. 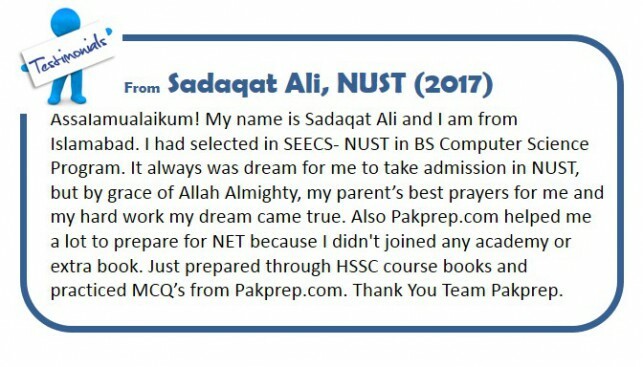 This entry was posted in NUST and tagged Best way to prepare for NUST, Best website to prepare for NET-I, Best website to prepare for NUST, Best website to prepare for NUST NET-I, Download NUST NET Past Paper, Download NUST Past Papers, How much marks I need in NUST NET?, How to Calculate NUST Aggregate, How to prepare for NUST, How to Prepare for NUST NET 2016, How to Prepare for NUST NET 2017, How to prepare for NUST NET-I, How to prepare NUST NET, How to Register for NUST NET Test, How to register how nust net, Important Maths Topics for NUST NET, Important Physics Topics NUST NET, Marks Required in NUST NET?, Mechatronics Engineering eligibility criteria, NET, NET 1, NET 2, NET 3, NET-I explained MCQ’s, NET-I MCQ’s, NET-I MOCK test, NET-I past papers, NET-I solved MCQ’s, NUST, nust 2015, nust 2016, nust 2017, nust admission, nust admission 2017, Nust Admission Test, Nust Admission Test 2015, Nust Admission Test 2015 engineering, Nust Admission Test 2016, Nust Admission Test 2016 engineering, Nust Admission Test 2016 NUST NET 2016 Preparation, Nust Admission Test 2017, Nust Admission Test 2017 engineering, Nust Admission Test 2017 NUST NET 2017 Preparation, NUST Aerospace Engineering eligibility criteria, NUST Aggregate, NUST aggregate 2014, nust Aggregate 2016, nust Aggregate 2017, NUST Bachelor of Industrial Design, NUST Bachelor of Industrial Design program, NUST Bachelor of Military Art and Science, NUST Bachelor of Military Art and Science program, NUST BBA (Hons. ), NUST BBA program (Hons. ), NUST BE (Telecom), NUST BE Aerospace (Aviation Mechanical), NUST BE Aerospace program (Aviation Mechanical), NUST BE Avionics (Aviation Electrical), NUST BE Avionics program (Aviation Electrical), NUST BE Chemical, NUST BE Chemical program, NUST BE Civil, NUST BE Civil program, NUST BE Computer, NUST BE Computer program, NUST BE Electrical, NUST BE Electrical program, NUST BE Environmental, NUST BE Environmental program, NUST BE Geo Informatics, NUST BE Geo Informatics program, NUST BE Industrial and Manufacturing, NUST BE Industrial and Manufacturing program, NUST BE Materials, NUST BE Materials program, NUST BE Mechanical, NUST BE Mechanical program, NUST BE Mechatronics, NUST BE Mechatronics program, NUST BE program (Telecom), NUST BE Software, NUST BE Software program, NUST Biology MCQs, NUST BS Accounting & Finance, NUST BS Accounting & Finance program, NUST BS Architecture, NUST BS Architecture program, NUST BS Computer Science, NUST BS Computer Science program, NUST BS Economics, NUST BS Economics program, NUST BS Mass Communication, NUST BS Mass Communication program, NUST BS Mathematics, NUST BS Mathematics program, NUST BS Physics, NUST BS Physics program, NUST BS Public Administration, NUST BS Public Administration program, Nust Chemistry MCQs, NUST Civil Engineering eligibility criteria, NUST Computer Science (Islamabad) eligibility criteria, NUST Computer Software Engineering eligibility criteria, NUST Electrical (Telecom) eligibility criteria, NUST Electrical Engineering eligibility criteria, NUST Eligibility Criteria, nust engineering, NUST Engineering Past Paper, Nust Entrance Test, Nust Entrance Test 2015, Nust Entrance Test 2016, Nust Entrance Test 2017, nust entry test, NUST Entry test 2015 preparation, NUST Entry test 2016 preparation, NUST Entry test 2017 preparation, NUST entry test expected dates, NUST entry test expected dates 2018, nust entry test preparation, NUST Environmental Engineering eligibility criteria, NUST explained MCQ’s, NUST FEE Structure, nust financial aid, NUST Geo Informatics Engineering eligibility criteria, NUST Integration MCQs, Nust Islamabad, NUST Maths MCQs, nust mcqs, NUST Mechanical Engineering eligibility criteria, NUST Merit 2014, nust merit list, NUST merit list 2016, NUST MOCK test, NUST Mock Tests, nust net, NUST NET 1, NUST NET 1Paper Pattern, NUST NET 2, NUST NET 2017, NUST NET 2017 Format, NUST NET 2017 MCQs, NUST NET 2017 Physics MCQs, NUST NET 3, NUST NET 3 Preparation Online, NUST NET 3 Solution, NUST NET Biology MCQs, NUST NET Chemistry MCQs, NUST NET Maths MCQs, NUST NET Online Preparation, NUST NET Online Test Preparation, NUST NET Paper Pattern, NUST NET Past Papers, NUST NET Physics MCQs, NUST NET Practice Test, nust net preparation, NUST NET preparation 2016, NUST NET preparation 2017, NUST NET result, NUST NET-I, NUST NET-I eligibility criteria, NUST NET-I entry test, NUST NET-I expected dates, NUST NET-I explained MCQ’s, NUST NET-I MCQ’s, NUST NET-I MOCK test, NUST NET-I past papers, NUST NET-I solved MCQ’s, Nust past paper, NUST Past Papers, NUST Past Papers Engineering, NUST Past Papers Medical, nust physics, Nust Physics MCQs, Nust Practice MCQs, Nust practice test, nust programs, nust scholarships, NUST Semester FEE, NUST Software Engineering eligibility criteria, NUST Solved MCQs, Nust test, nust undergraduate, nust undergraduate admission, nust undergraduate admissions, nust undergraduate program, nust undergraduate programs, NUST University, online NET-I preparation, online NUST NET-I preparation, online NUST preparation, Sample NET questions, Sample NET-I Chemistry questions, Sample NET-I Math questions, Sample NET-I Physics questions, Sample NUST Chemistry questions, Sample NUST Math questions, Sample NUST NET-I Chemistry questions, Sample NUST NET-I Math questions, Sample NUST NET-I Physics questions, Sample NUST Physics questions, sample NUST questions, Solved NUST MCQs, Solved NUST Past Paper, Where to prepare, Where to prepare for NET-I, Where to prepare for NUST, Where to prepare for NUST NET-I, Where to prepare for NUST NET-I entry test on October 29, 2018 by Pakprep.com Admin.